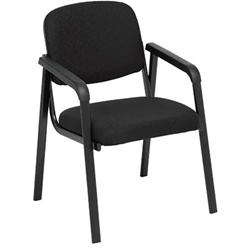 Features: Heavy duty Meeting / Visitor chair. Colours: Black fabric and Vinyl along with Navy fabric options available. Frame: Heavy Duty steel frame Powder coated Black. Seat: 490mm wide x 465mm deep. Back: 470mm wide x 380mm high.